There are many reasons why students quit their bass lessons. Sometimes it’s because the teacher doesn’t inspire them, or because the lessons aren’t focused enough on their specific goals. In some cases, it could be that the teacher isn’t qualified and really doesn’t know how to help the student become the musician they would like to be. Then again, it could be that the student’s relationship with the teacher and the teachings aren’t as focused as they need to be in order for the student to progress. Having taught fretboard music successfully for many decades and to many students, I have come to realize that the way in which a student relates to the teacher has a very meaningful effect on the student’s development. Different students get varied results from the same teacher and teachings. This is because different students approach the learning process uniquely. For example, one student might believe to know better than the teacher and eventually quits, while another student learns and applies everything that is presented and becomes a world-class bass player. We all understand the wonderful attitudes, aptitudes and behaviors of the student that goes on to become a world-class player, however, let’s look more carefully at different types of behaviors commonly displayed by students who can easily become frustrated and quit their bass lessons. Some students want to master everything that is presented in a lesson before moving on to something else. This may seem like a good idea, but in reality, it is not the most effective way to progress. Music is best learned when many elements are worked on simultaneously without worrying about mastering any one given component. For example, the student must work on the technique of playing the bass, while at the same time learning the theory of harmony, improvisation and composition. The point is, after learning something new, don’t hesitate to begin combining it with everything else you have previously learned. Application and integration are essential elements that must be developed from the very beginning. By proceeding in this way, the student will not let one aspect of their learning get too far ahead of the other things that they know. Approaching music and the bass in this multi-tasking manner will keep the student in balance. I only want the new. Some students think that each lesson should consist mainly of new material. However, this isn’t necessarily the best approach. The simple reason is that too much new information leads to the feeling of being overwhelmed. This is because there is not enough time to integrate this new information with past information. Being overwhelmed is what causes most students to become frustrated and quit. Here’s an important point: simply learning new information will not improve technique. Technique takes time to develop and demands more than just simply being aware of a new musical concept. In other words, it requires lots of practice to achieve the fluency of technical skill needed to play the bass proficiently. Remember, you can buy knowledge, but can’t buy technique — technique must be earned! Said again, the student may think that learning something new in each lesson is a good thing, but, as time goes by they will notice that they are not making significant technical progress. At this point, the student may want to quit because they think lessons aren’t effective, however, that is not really the reason for their lack of progress. Said a different way, learning new musical information is an important part of lessons, but, if the student is only interested in learning the new, they will probably not continue with lessons and will miss out on one of the most important aspects of taking lessons which is the unfoldment of knowledge. Unfoldment being the in-order process which leads to the progress of information presented. It is this in-order presentation of knowledge that makes bass lessons so valuable. The student will need to practice patience to realize this and gain the benefits of unfolding learning over time. Some students have been playing for a while and perhaps have studied with other bass teachers. These students may have preconceived ideas about what their lessons should be and may wish to control what and how they are taught. Asking questions and expressing goals to the teacher is a good thing, but trying to direct the teacher as to what and how to teach is not. If the student seeks help from a qualified teacher, they should trust the teacher and accept the fact that the teacher knows more about music and bass than they do and therefore can successfully teach the student. With that said, all bass teachers are not the same, some are more qualified than others. This is why the student needs to clearly communicate their goals, and challenges to the teacher. That way, if the student is not receiving what they communicated, then they should seek a different teacher. What’s important is that the student needs to have faith and belief in the teacher they have selected and commit themselves to the lessons. If the teacher has helped others to succeed, then probably that teacher will be able to help you as well. Just remember, the teacher’s ability to help you will be limited and delayed if you constantly question everything that is taught. Working with a qualified teacher is the fastest and most efficient way for you to achieve your goals. So, if you truly want to accelerate the process of progress, then you should think about your relationship with your teacher to see if there is any room for improvement. There are many other factors that affect the rate of progress when learning music and the bass. But, if you study with a qualified teacher, follow the most effective music method, for example the Tone Note® Music Method for Bass http://www.12tonemusic.com/bass/tonenote, and develop rewarding practice habits, then you will become the musician playing bass that you have always wanted to be! Sheet music is a form of music notation that uses written symbols and signs to represent the sound of music. The medium of sheet music has progressed from clay tablets to parchment, and from paper to computer screens. Sheet music may be written by hand, printed by a press, or sent from the computer to a graphic printer. The term “sheet” is used to differentiate written music, regardless of the medium, from an audio presentation of sound as experienced through records, tapes, CDs and mp3s. Sheet music may be thought of as a way of notating sound so as to preserve and more quickly learn a piece of music. Sheet music can be studied to elucidate aspects that may not be obvious from mere listening. Insightful musical information may be gained by studying the composers autograph score, as well as written sketches, early versions of the composition, personal markings on proofs and printed scores. Sheet music requires the ability to read music notation which is a special form of literacy. This skill enables a musician to perform a piece of music they have never heard by simply viewing the sheet music. When this occurs the first time it is called sight reading. A more refined skill is needed to read a new and unfamiliar piece of music and then hear the melody and harmony in one’s head without having to play the piece. With the exception of solo performances, where memorization is expected, most musicians ordinarily read sheet music when performing. However, printed sheet music is less important in certain musical styles such as folk and pop. With jazz and other improvised music, sheet music is called a lead sheet and is used to give only the most basic indications of the melody, harmony, and arrangement. Although much popular music is published in notation of some sort, for example fake books and TAB, it is quite common for improvisational players to learn a song by ear. This was frequently the case with traditional folk music, where songs were passed down by an aural tradition. Although sheet music is most often thought of as being a means for learning new music, it can also serve as a visual record of music that already exists. Transcriptions of such music into staff-notes and tablature render them into readable form for study, analysis, and performance. This is done not only with traditional folk songs, but also with sound recordings of improvisations by rock and jazz musicians. Modern sheet music comes in many different formats. For example, sheet music can be issued as an individual piece for a popular song, or as a collection of works by a given group or artist. Usually, if a piece is composed for just one instrument or voice, then the whole work may be printed as one sheet. However, if an instrumental piece is intended to be performed by more than one person, then each performer will usually have a separate sheet from which to play. This is especially true of works requiring more than four performers. In that case, a full score will usually be published for the conductor or director. When the separate instrumental or vocal parts of a musical work are printed on the same sheet, it is called a score. A score generally consists of musical notation with each instrumental or vocal part in vertical alignment. Scores come in many formats, such as: full score, study score or miniature score, piano score, vocal score, choral score, organ score, musical score, and a short score. In addition to scores, there are lead sheets, chord charts and tablature. A lead sheet presents a one staff-note melody with harmony symbols placed above the staff and lyrics below. A chord chart contains little or no melodic content, but provides detailed harmonic and rhythmic information. Tablature is a special type of instrumental notation that dates from the late Middle Ages. Tablature includes rhythmic notation, but only shows where to play the pitches on any given instrument, not which pitches to play. Artifacts show that sheet music began as rudimentary musical codes written on clay tablets by ancient Babylonians nearly 4,000 years ago. Elementary music notation was then developed by the ancient Greeks and Romans. This early written music continued to evolve until around the 7th century when Catholic monks began approaching the task of symbolizing sound with quills and ink on decorative vellum and parchment. These illuminated manuscripts were bound in large volumes. The best known of these manuscripts were of religious monophonic chants. With the introduction of polyphony, 9th-14th century, the individual parts were written separately and presented on facing pages. 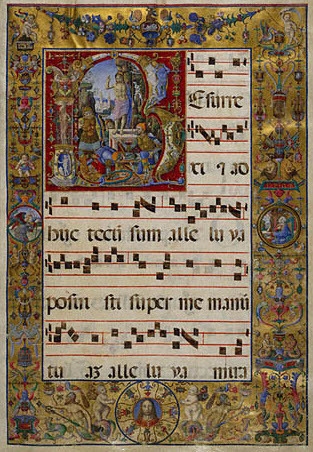 The medieval practice of composing polyphonic parts sequentially rather than simultaneously meant that manuscripts showing parts together in vertical score format were rare. Fortunately for us, sheet music survived the Dark Ages and went on to become an important musical force during the Renaissance, 14th-17th century. It is interesting to note that even after the advent of music printing in the 15th century, there was still an abundance of sheet music that only existed in manuscript form well into the 18th century. With the invention of Gutenberg‘s printing press during the 15th century, printed sheet music became much more accessible to the masses. The first machine-printed book to include music was the Mainz psalter of 1457. It included printed staff lines, but, scribes still had to add the rest of the music by hand. In 1501, the Harmonice Musices Odhecaton A, which contained ninety-six pieces of polyphonic music was printed. A common way for issuing multi-part polyphonic music during the Renaissance was in the form of part-books. In this format, each voice-part would be printed separately in its own book and multiple books would be needed to perform the music. Scores for multi-part music were rarely printed. The printing method at that time produced clean and readable music but required three separate passes through the printing press. It was discovered that the greatest difficulty in using movable type to print music was aligning all the musical elements, for example, assuring that the note head was properly positioned on the staff. In 1520 single impression printing appeared and eliminated this alignment problem. Around this time, the first tablature with movable type was printed. Printing remained mostly unchanged for the next 200 years. The benefit of printed music was that it spread information faster and more efficiently to more people than was possible through bound manuscripts. Printed music also had the additional effect of enabling amateur musicians to afford sheet music to perform. This resulted in composers writing more music for amateurs. This increased the number of amateurs from whom professional players could earn money by teaching them. And this in turn, allowed the professional to buy more sheet music. It should be noted that in the early years of printed sheet music, the cost still limited its distribution. Politics also played a role in the history of sheet music. In many places the right to print music, now known as a copyright, was granted by the monarch. Only those with a special dispensation were allowed to print music. As you can imagine, this right was, more often than not, granted to a favored court musician. Politics aside, printed sheet music was impacting Europe in ways unimaginable by past generations and soon it would do the same in the American Colonies. The first music printed in North America was The Bay Psalm Book, 1640. This book contained only text because the congregations of churches were assumed to know the music by heart. Print music publishing continued to develop and expand throughout the 18th century. By the early 19th century, the music industry was dominated by sheet music publishers due in part to the fact that by this time musicians began to pay for the privilege of performing a writer’s music. At the same time, lithographic techniques replaced metal engraving as a fast and efficient method of reproducing multiple copies of musical scores. This enabled the printing of sacred and secular music to become a booming industry. This helped to employ more people and give rise to the middle class. As a result, more individuals had the time and money necessary to invest in instruments for their homes, town bands, and attendance to the symphony hall. The late 19th century saw a massive explosion of parlor music, with a piano becoming the instrument of choice for middle class homes. By 1890, many department stores opened counters for the sale of sheet music, and its popularity forced the price down. It’s safe to say that the growth of American popular music, including jazz, country and western, bluegrass, spirituals, and theater music, may be attributed not only to talented composers and artists, but also to the publishers who made it possible for the amateur to play at home. By 1910, Woolworth sold sheet music for 10 cents a copy! By the early 20th century, the sheet music industry rose in tandem with a group of New York City publishers and composers collectively known as Tin Pan Alley. These talented individuals were made rich and famous by the swift availability of their songs in sheet music form. The sheet music industry experienced another boost in 1914 when the first performance rights society, The American Society of Composers, Authors and Publishers, Inc. (ASCAP) was established. In 1931, The Society of European Stage Authors and Composers, Inc. (SESAC) was founded. It was followed by Broadcast Music, Inc. (BMI) in 1940. Music rights organizations were essential for the orderly administration of performance data and distribution of royalties for music in copyright. They also played an important role in funding the first efforts of young composers and songwriters. The mid 20th century saw a new growth in sheet music fueled by the phonograph and radio industry which grew in importance and further popularized a wide range of music. By the early 1950’s, technological improvements in sound recording and television again accelerated popular interest in sheet music. But eventually, the record industry overtook sheet music as the dominant musical force since it was easier to play a phonograph than to play an instrument! Near the end of the 20th century, a great deal of interest arose in how to present sheet music in a computer read-and-write format suitable for the down-loading and up-loading of files. In 1984, computer music notation programs for home use were developed and released. They introduced concepts largely unknown to the home user at that time, such as allowing for the manipulation of music symbols and signs with a mouse. These computer programs allowed for playback of music through various early sound cards. In addition, the user could print the musical score via a graphic printer. In 1991, software that could read scanned sheet music was introduced. Needless to say, this Music Optical Character Recognition (MOCR) software created a completely new manner of distribution for sheet music which was referred to as virtual sheet music. By 1998, virtual sheet music had morphed into digital sheet music. The difference between the two was that digital sheet music allowed copyrighted sheet music to be purchased online from the publisher or dealer. Another important difference was that digital sheet music could be altered in ways virtual sheet music never could. This made digital sheet music ideal for instrument changes, transposition and MIDI playback. In 1999, a system for coordinating a digital music display to orchestral musicians was presented and performed. The popularity of this instant delivery system among musicians, now through the use of iPads, appears to be the catalyst of growth for digital sheet music that will last well into the future. In the 21st century, sheet music, like most other forms of communication, has fully joined the digital age. In fact, it may be said that digital sheet music is the musical notation system of the 21st century. The popularity of digital sheet music has revitalized the sheet music industry, which had been languishing since the invention of the phonograph. Digital sheet music has made music notation available on a scale the likes of which its creators could never have imagined. Digital sheet music is the future of sheet music, and no where is this more apparent than with the Mutopia Project. This project is an effort to create a library of public domain sheet music comparable to Project Gutenberg’s library of public domain books. Also, the International Music Score Library Project is attempting to create a virtual library of scores from composers who are willing to share their music with the world free of charge! Projects like these make it easy to understand that there will come a time when digital music libraries will be very extensive indeed. The long and winding history of sheet music is an exciting story of invention, evolution and distribution. Now, if all those ancient musicians could see the form that sheet music has taken today, I’m sure they would find it beyond belief. ‘Til next time, have some sheet music fun… I’ll be listening! Is your knowledge of the guitar fretboard incomplete, out-of-order, fragmented and disconnected? If so, then you should get a deck of guitar flashcards and begin feeling complete, in-order, whole and connected. You and your guitar will be happy you did! While it’s true that music has 12 sounds in one octave, those 12 sounds have 21 letter names! I know, this sounds complex and confusing, but it’s really not if you think of it in this way. There are 7 natural letters, 7 flat letters and 7 sharp letters. Simply stated, 7 + 7 + 7 = 21! and 7 sharp letters: #A #B #C #D #E #F #G.
Said one more time, 7 natural letters + 7 flat letters + 7 sharp letters = 21 letter names for 12 sounds! And since there are six strings on a guitar, this means that to have a complete deck of guitar flashcards, you must have 126 cards. Here’s the math: 6 strings x 21 letter names = 126 cards! Now, here’s an amazing fact. 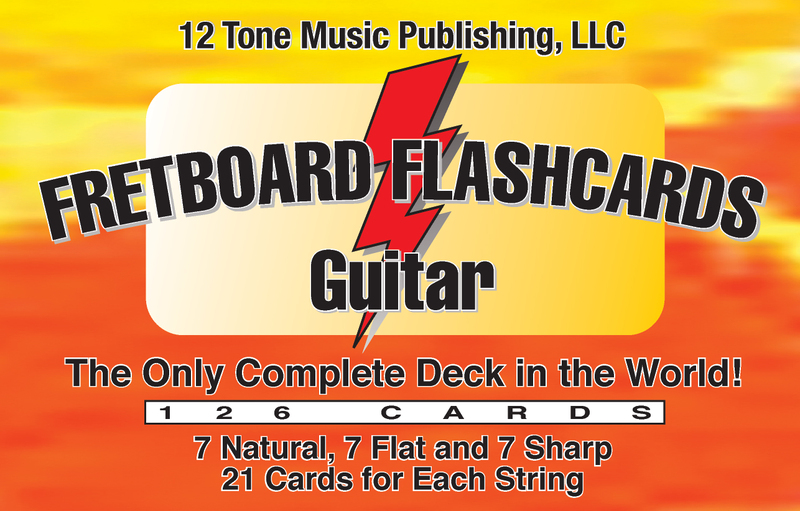 Only Guitar Fretboard Flashcards from 12 Tone Music Publishing has 126 cards in the deck, making them the only complete guitar flashcard deck in the world! To prove this, just Google guitar flashcards and see for yourself, no other deck of guitar flashcards in the entire world has 126 cards in the deck. Now, let me ask you a question. Would you buy a puzzle if it was missing pieces? Of course the answer is no. So, why would you buy a deck of guitar flashcards that was missing cards? Remember, you can’t succeed if you’re incomplete! Let’s begin by imagining that you want to go to Jill’s house, but, you don’t know where she lives. However, your friend Jack does, and he agrees to take you there. So, you go to Jack’s house and then together you go to Jill’s house. So far, so good. Later, you want to go to Jill’s house by yourself, but, the only way you know how to get there is to go to Jack’s house, and then go to Jill’s house. Here’s the problem. While it’s true you get to Jill’s house, it takes you twice as long to get there than if you had learned to go directly to Jill’s house in the first place. Direct is faster! So, what does this have to do with playing guitar? To understand this, let’s explore Sign Before Symbol. A symbol represents something, but, it is not what it represents. For example, in music, the letter E represents the sound of E, but, the letter E is not the sound. A sign implies an action. In other words, a sign tells us to do, or not to do, something. For example, a stop sign tells us to do something: stop. However, it also tells us not to do something: don’t go. Traditional guitar flashcards use a letter symbol to represent a sound on the fretboard, and two accidental signs, the sharp #, and the flat b, tell us to do, or not to do something. However, Guitar Fretboard Flashcards differ from traditional guitar flashcards by presenting the sign before the symbol. Let’s explore this very important difference. In traditional music notation, the letter symbol is presented first and the accidental sign follows. In other words, traditional music notation places the sign after the letter symbol. However, by placing the sign after the letter symbol, traditional music notation makes you go to where you don’t want to be, then has you change your mind to then go to where you wanted to be to start with! This traditional approach to an accidental letter symbol makes you twice as slow as you should be. Sign Before Symbol presents a new and direct way of thinking that is guaranteed to make you faster. Let’s continue. We’ve already discovered that to go to Jack’s house, which we will call A, and then to get to Jill’s house, A#, will take twice as long as it should because we must first go to Jack’s house A before we can change our mind and go to Jill’s house A#. In contrast to this traditional approach, Sign Before Symbol has you playing twice as fast by directing you to not go to A first and then A#, but rather, go directly to #A! Okay, let’s think this through on the guitar. Why go to string 6 fret 5 A so that you can get to string 6 fret 6 A#, when you can go directly to #A the very first time? Remember, sign before symbol teaches you that #A is not A or bA, so, don’t waste time going to those letter and fret locations, instead, go directly to #A the first time. Yes, it’s true, there is no doubt, Sign Before Symbol makes you faster! Now you can understand why sign before the letter symbol makes you faster, it takes you directly to the fret location of the letter you want to play. If the song you are playing asks you to play G and then C, and you only knew the letters on string 6 of your guitar, that would be okay, because at least you could play the sound of G on fret 3 and C on fret 8. However, because these letters are five frets apart, it would take a certain amount of time to travel that amount of distance. Remember what Einstein said: time is space! However, to play G and C faster would certainly be better. So, to play faster, use less energy and be more efficient, learn the letters on string 5 of your guitar. And then, because you know the letters on both string 6 and string 5, you will discover an amazing benefit ~ you can play G and C much faster. This is true because now they are closer, and closer is faster! Here’s the proof: G is on string 6 fret 3 and C is on string 5 fret 3. And since they’re on the same fret, and you can’t get any closer, faster is the result! As you continue to progress and learn the letters on all six strings of your guitar, you will discover the awesome benefit of playing your guitar as fast as you always wanted to! Studies of the whole brain have revealed that the left-brain likes to think. In other words, to calculate, reason, read words, and do math. This is a good thing. These same studies have shown that the right-brain likes to… well, not think, but rather be creative and see things like pictures and drawings and listen to music without really thinking about what it’s listening to. Kind of like day dreaming. And this too is a good thing. Of course you really don’t have two brains, both sides of the brain are connected and work as one. However, it is still helpful to understand the different functions of whole-brain learning so that we can understand the elegant design of Guitar Fretboard Flashcards. Let’s explore this. On the front side of a flashcard is a left-brain question: on this string, what fret is this letter? For example, on string 6 of your guitar, what fret is the letter A? As you can tell, this front side of the card makes you calculate these three different ideas ~ string, letter, fret ~ into one answer. This is left-brain fun. Then, when you turn the card over, the answer is presented, which, for the question just asked, is fret 5. However, not only are you presented the fret answer, but you also see a picture of the fretboard with an empty square on the correct fret so that you may visualize the location of the answer. But wait, there’s more. The staff-note of that letter location is also shown! This is right-brain fun. You can now understand how Guitar Fretboard Flashcards train you to use both sides of your brain so as to better remember and in turn, make you smarter! No other deck of guitar flashcards are designed with this degree of detail to guarantee the development of your Master Memory success. I don’t know where you are today, but, I know where you’ll be tomorrow, reviewing your flashcards for speed and clarity. And as a result, tomorrow you will be a better player than you are today. At some point you will see this harmony symbol: Gb5. This looks simple enough, and most guitar players would say that this is a “G flat power chord.” But are they certain? Could it be something else? Could it be “G with a flat 5 added?” The point is, we’re really not sure. We are confused because of a lack of clarity and certainty. This confusion comes from traditional music notation that places the accidental sign before a staff-note symbol, before a tone number (scale degree) symbol, before a harmony numeral symbol, but, illogically and incorrectly, places the accidental sign after a letter symbol! This unexplainable exception creates great uncertainty, confusion, frustration, and serious lack of clarity. What are we to do? The answer is very simple, be consistent and place the accidental sign before the letter symbol! This very simple action brings clarity and certainty, and avoids confusion and frustration. In other words, to be consistent, the accidental sign is always placed before the symbol, whether it’s a staff-note symbol, a tone number symbol, a harmony numeral symbol, or, simply a letter symbol. Avoiding confusion and replacing it with clarity is extremely simple and easy, just put the sign before a symbol in all cases! Let’s continue and prove our point with a more complex example. It’s easy to know what this harmony symbol is, bG5, because the accidental sign is placed before the letter symbol. It’s “flat G with tone 5 added.” The simple and clear reason why sign before symbol is not confusing is because its order is consistent. Here’s another example. Traditional music notation writes Gb#5. Wow! What in the world is that? Traditional music notation knows that this is confusing and unclear. How do we know that, because more symbols are added in an attempt to bring clarity to this obvious confusion. 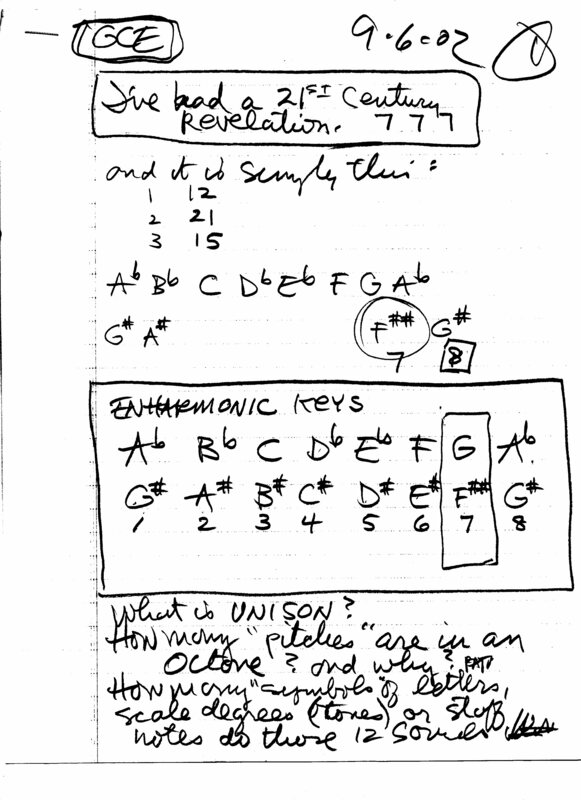 Here is the way traditional music notation writes it: Gb(#5). As you can see, more is not always better! In other words, extra symbols are not what is called for, what is needed is a simple and clear sign before symbol presentation. This logical order easily resolves the problem. It’s easy to see that, bG#5 is “flat G, sharp five.” Nothing could be more simple or clear. Now, here’s another example of traditional confusion, contrasted with simple and clear sign before symbol clarity. In the traditional way of thinking, a letter may be flatted or sharped twice. In other words, double flat and double sharp, for example, Gbb and F##. And to add to this confusion, traditional music notation uses an x to symbolize ##. In other words, F## is written Fx! This is certainly not necessary, because a symbol of another symbol only adds to the confusion. By the way, Gbb sounds like F natural, and F##, also shown as Fx, sounds like G natural. This “sounds like” concept is called enharmonic, and enharmonic presents problems all its own, but, that’s another lesson. As you progress in music, you will eventually encounter this very troubling harmony symbol: Gbbb5. Yikes! What the heck?! Is this “G double flat with flat 5 added,” or “G flat with double flat 5 added,” or “G with a triple flat 5 added? !” Talk about confusing and unclear!! Fortunately, sign before symbol again brings simplicity and clarity to this truly unruly harmony symbol. It could be, bbGb5 “double flat G flat 5,” bGbb5 “flat G double flat 5,” or, in some extreme bizarre case, Gbbb5 “G triple flat 5!” We could go on and on with harmony symbol clarification, but, you get the point, your future will always be simple, clear, and void of confusion because of sign before symbol. Learning the letters on your guitar fretboard is one of the most powerful and useful skills that you can develop. So, if you’re ready to have some fast and easy letter learning fun, here are some exciting ways to improve your performance skills. Begin by learning the 7 natural letters horizontally, east and west, on string 6 of your guitar. You will quickly discover that learning the 7 natural letters and their 7 fret locations on string 6 is as easy as learning a telephone number, which also has 7 numbers. Start by selecting the seven natural letters of string 6. Shuffle these 7 natural letter flashcards so that they are out-of-order. Work with one card at a time. Memorize the fret location for that one letter. Don’t use your guitar, but rather, visualize the positions on the guitar fretboard as you memorize the locations. When you can recall the fret location for a letter without hesitation, then move on to the next card. Proceed with the remaining six cards until you have memorized all 7 letter and fret combinations. There are lots of opportunities throughout the day for review, for example while you’re walking to school, riding in the car, or, waiting for the school bus, or if you’re older, during lunch at work. Be sure to drill the 7 natural letter flashcards several times a day to get faster and faster. After the 7 natural letters are memorized, it’s time to learn the flat and sharp letter names. You will notice that some frets have more than one letter name. As was said earlier, this is called enharmonic. Enharmonic means “one sound with more than one symbolic letter name.” For example, bA, flat A, sounds the same as #G, sharp G, but as you can see, the same sound has a different letter name. The “correct” letter name for a sound depends on the key you are in. Here’s an example. The bE major scale is spelled bE F G bA bB C D. Therefore, in this key of bE major, the fourth sound of this scale scale is bA. However, in the A major scale, which is spelled A B #C D E #F #G, the seventh sound is #G. So again, as you can see, the letter name given to the same sound depends on what key you are in. For more of this type of thinking, be sure to get your copy of Guitar EncycloMedia. To summarize, begin with the 7 natural cards. Then move on to the 7 flat cards. Be sure to take your time. Then, after you have memorized the 7 flat letter and their 7 fret locations, start working with the 7 sharp cards. Again, be patient and take your time. By using this simple method, you will quickly and easily memorize all 21 letter names on one string. Then, after you have memorized the letter locations on one string, you may then move on to the next string and begin the process again. Do this until you can say the letter locations on each string of your guitar without hesitation. Remember, learning all the letters on all the strings is a challenge, however, with practice, patience and time, learning the 21 letters on each string of the guitar fretboard will be easy, fast and fun! There are many ways to use your flashcards, for example, here’s a method for learning the same letter on different strings and frets. Begin by selecting only the cards from each string that have the same letter. You will notice that some of these cards sound in unison, in other words, they have the same letter, same staff-note and same sound. Yet, some of these same letter cards sound in octaves, with the same letter, but with a different staff-note and a different sound. Here’s another suggested use of your flashcards. Learn the natural letters vertically, north and south, one fret at a time. Here’s the method. Start with the frets with all natural letters: fret zero, fret 5 and fret 10. Drill one fret vertically until you have it memorized. Be sure to say the string and letter name and then flip the card over and say the fret number. As you work through the cards one fret at a time, visualize the fretboard in your mind with your eyes closed. After learning a new fret, go back and review all the frets you have learned up to that point. Remember, you are building your knowledge and will need to reinforce what you’ve previously learned. After learning all the frets which only have natural letters, you may begin to add the frets with flat letters. Then add the frets with sharp letters. It is best to spend a few minutes every day reviewing your flashcards so as to reinforce what you’ve learned. Remember, there are lots of opportunities throughout the day to practice and drill, its easy, fast and fun… and you don’t even need your guitar! By following the simple suggestions above, you will memorize all 21 letters on all strings in less time than you might have imagined. And when you’re really good, you should be able to say the letter names for any string without hesitation. Don’t forget, practice makes you faster! Simply stated, a benefit is something you can do because of something you have or know. The following summary lists but a few of the many remarkable benefits to be gained from using your flashcards. Complete Knowledge – This means that from the very beginning, you will know the complete alphabet of music on your fretboard. This is because the first thing you learn is 21 letters, and more importantly, that is all that you will ever learn. In other words, with your very first thought ~ you’re finished. You will never have to learn another letter on the fretboard… ever! Now, you can get on with playing all the incredible songs that you have always wanted to play. Don’t forget, drilling your fretboard flashcards will make learning the letters and staff-notes easy, fast and fun without effort or strain. Your guitar playing success is guaranteed! Duel Understanding – By using both sides of your brain to learn and memorize, you will become smarter. You will find that remembering is easy because of whole brain learning. In other words, since the frontside of a flashcard uses the left side of your brain to connect a letter or staff-note to a fret, and the backside of the flashcard uses the right side of your brain to connect a fret to a letter or staff-note, developing a Master Memory is guaranteed. These two different aspects of the flashcards in conjunction with the two sides of your brain, like two sides of one coin, will make you equally skilled in both directions: letter, staff-note/fret and fret/staff-note, letter. No Hesitation – You can now focus your attention on playing and enjoying music on your guitar because you don’t have to waste time and energy trying to locate a letter on the fretboard. Said another way, minimizing hesitation, eliminating mistakes and avoiding frustration will result in you become faster at reaching your goal of complete fretboard knowledge. Simple and Clear – As your understanding of the fretboard becomes clearer, learning becomes simpler, and your playing improves quickly. Your technique and skill becomes much faster, cleaner and clearer. You become much more effective and efficient at playing guitar because you have simple, clear and immediate knowledge of the entire fretboard. New View – With this new view of 7 + 7 + 7 = 21, you can never be any more complete, effective or efficient. In other words, now that you have the total fretboard knowledge of 7 natural letters, 7 flat letters and 7 sharp letters on every string, you can now think with a new and direct sign before symbol view. You don’t waste precious time going to the wrong location to eventually get to where you wanted to go in the first place! Said a different way, with this new view, you can’t get there any faster. Many Applications – You will also discover that by knowing 21 letters on the fretboard immediately you are able to understand with clarity and certainty the more complex aspects of music. For example, key signatures, scale spellings, chord inversions, harmony voicings and the parabola of 4ths and 5ths. In other words, musical thoughts and ideas that once seem complicated and confusing will now be as easy as pie! Yummy. More Benefits – As you progress, you will learn how easy it is to start as a beginner and quickly become an advanced player in much less time than you ever thought possible. You will break through barriers that have kept you from being the awesome guitar player that you know you are by accelerating all aspects of your musical knowledge and fretboard skills. You will discover that you are able to play riffs and licks with incredible speed and accuracy and that you can create original and memorable melodies and harmonies effortlessly. You will advance your ability to “play by ear” and develop the skill necessary to express your remarkable and original talent. You will discover that you can write hit songs that the world will sing with ease. You will access the incredible versatility that allows you to play all genres and styles of music from rock to jazz to blues to country to classical to whatever. You will feel confident playing with others, whether live or virtually with YouTube, or your favorite iPod superstar! As you can see, the benefits of using Guitar Fretboard Flashcards are virtually infinite… be sure to let me know what you like to do with them. I’m listening, and I’m here for you! Welcome, and thank you for visiting this first 12tonemusic blog. The purpose of this blog is to share with you what goes on in my mind as music meets the guitar and bass fretboard. I would like to share with you, in no particular chronological order, the very quick and raw, unedited hand written pages before I sit down at the computer and spend way too much time editing and polishing these original rough words and illustrations into a polished article or book. So, here’s my plan. I’ll scan in the page, write a few words of presentation, and then get out-of-the-way… sounds simple enough. Okay, let’s begin with a 21st Century Revelation I had in September of 2002. It’s simple on the surface, but like leverage ~ a simple fulcrum can move great weight. Here’s was my idea: if there are 7 natural letters, then there has to be 7 flat letters and 7 sharp letters. In other words, 7 + 7 + 7 = 21! Or, said a different way, if one Octave has 12 Sounds, then, one octave must have 21 Symbols. This was a major epiphany for me, it clarified a whole life of prior music knowledge… and it just might do the same for you. Here’s the first rough draft of this path-breaking thought. To begin understanding the leverage of this simple 21 symbol fulcrum is to realize that it answers the traditional question: if there are only 12 sounds in one octave, why are there 15 Major keys… but that’s another post. So, till next time, play and have fun ~ I’ll be listening! You are currently browsing the 12tonemusic blog archives for April, 2014.